Its been a long time that we are struggling with EPMA, Calc Manager and Capex. We wanted to use Capex with our EPMA Planning application. So we created a new application in EPMA with all the custom dimensions (Renamed Entity to Cost Center, Year to Years, added some custom members)and tried to initialize Capex and during the initialization it failed with some errors in log file. Most of the errors were due to the fact that some of the in-built forms of Capex were not created. So we just ignored the error and went ahead with the Application. Then we tried to deploy the entire application from Calc Manager and got an error saying “Application needs to be in deployed state”!!!!!!! We were clueless and then decided to recreate the application – this time without any custom dimensions and without any renaming (Entity as Entity, Year as Year). 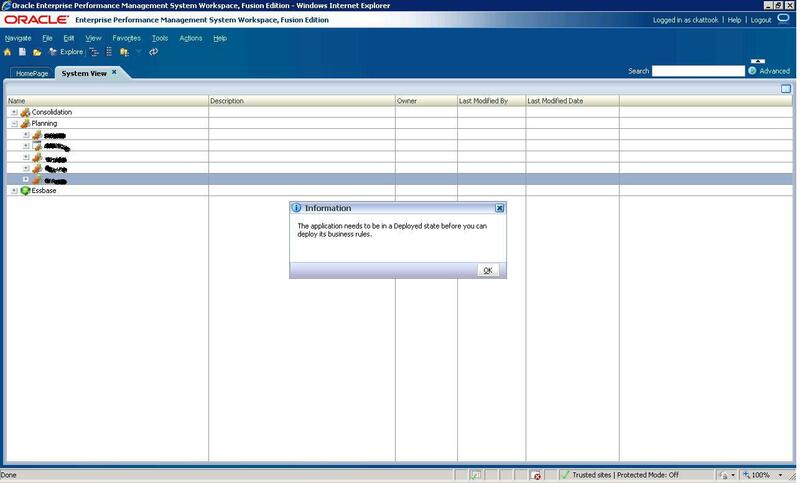 [Mar 22, 2011 3:59:47 AM]: Error Failed to enable capex during initialization. Please see log for details[Mar 22, 2011 3:59:47 AM]: Error Content is not allowed in prolog. But soon we got to know that this is something related to Calc Manager, because we were not able to deploy any existing rules or new rules. After lot of experiments (I still remember the permutation and combination problems that I used to solve and those were very helpful here) like creating the application in Classic and then migrate to EPMA, then tried different combinations in EPMA, which didn’t yield any results. At last we created a Classic Application with all default members and used Business Rules as Calculation mode and initialized Capex, which was successful (ray of hope!!!!!). Made the custom changes (Entity to Cost Center, Year to Years) and then Migrated it to EPMA which was successful. (Only issue was we named Capex cube as CapPlan, but it is still showing as Capex). We tried to then deploy a new Calc Manager rule and viola it was successful. Now the investigation started why it was failing before and as usual we ended up in the relational tables (but this time it was the EPMA tables). In this there is a column called C_OBJECT_STATUS. 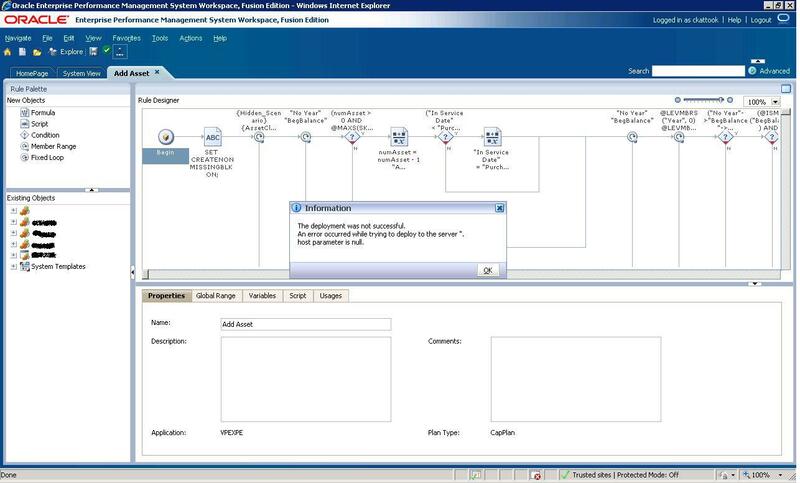 EPMA/Calc Manager looks at the values in here if its a deployed application or not. A value of 8 indicates that the corresponding application is non deployed. A value of 4 indicates that the corresponding application is in a transition state. Our application were we were having an issue was tagged as 8 and only we had to do was change it to 2. How's that 11.1.2 working out for you? We've customized it….but the main issue was to get the Calc Manager to work. I personally kind of not liking it much…(mainly because of the error logging). Yes we were, you've to re-start Calc Manager services after the status change.